Contributors, purchasing and free download information listed below. Or enjoy our free PDF download. Jasna Babic, Tristan Wibault, Spencer Sunshine, Maxigas, Mujinga, G.B. Santos. 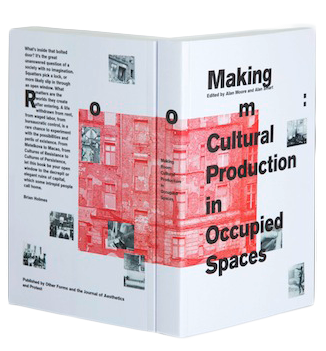 Making Room: Cultural Production in Occupied Spaces is a first of its kind — an anthology of voices from the post-1968 squatting movement in Europe which is focused on creative production and cultural innovation. Is squatting art? It is certainly a tactic which has enabled a tremendous body of collective work in culture to be done, and new kinds of lives to be lived. Making Room lays it out in the words of those who did it and study it. The dark matter undercommons of disobedient culture surveyed in this book begins its roam in a theoretical introduction including autonomist theory, the ways of “monster institutions” and simple economic justice. Then it moves from north to south, portraying by country the specific local conditions of an international movement. The book is organized by country; Netherlands, Denmark, UK, Germany, Italy, France, Spain, Anywhere, Elsewhere. Memories and thoughts are driven from so many historic squats, including; La Casa Invisible, MACAO, La Miroiterie, Teatro Valle, Gängeviertel, Rote Insel, Stutti, The House of the Process Church, The Youth House and others. click here for more info on contributions or just download the free pdf.